Take the Chickenblog poll. Amuse me. Don't read "Chickenblog?" Don't know where you are? You are here, and it is good here. We have fun, we share, we laugh together. We ask the big questions, then we have cake. Chickenblog is a "Blog of Note" and, confidentially, Blogger doesn't like to mention this, but 9 out of 10 people who read and leave comments on a "Blog of Note" blog are healthier, and their wildest dreams have an increased probability of coming true. Just saying. 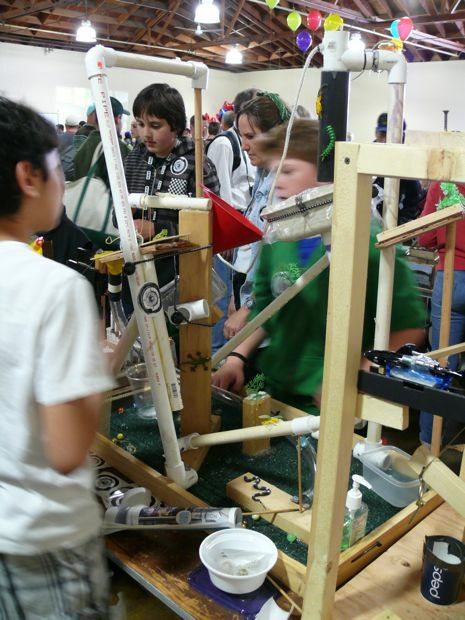 I took six hundred photographs at the San Mateo Maker Faire. Geoff had his own camera. We were only there for one day. We spent more time driving there, than at the Faire, and then we had the long drive home. 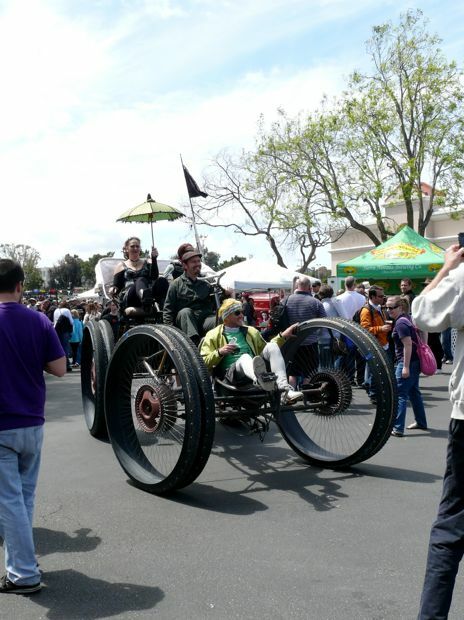 But it was so worthwhile, every SteamPunking-Cupcake car-ArcAttack-Maker moment was truly awesome. 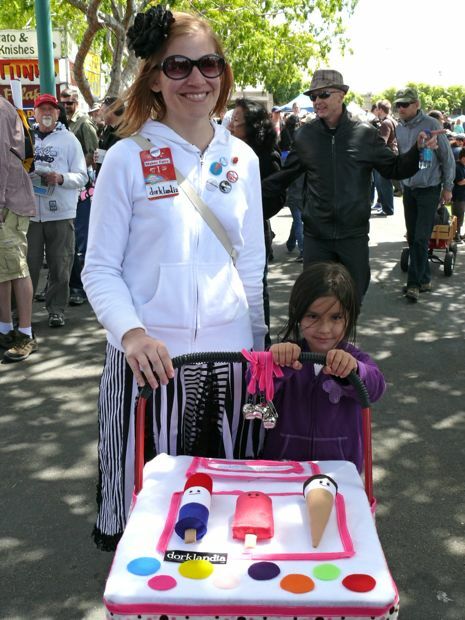 So, can you blame me for wanting to share more Maker Faire magic? Breathlessly, with a wide grin, I told William, "I am going to have about a hundred new things to post about on Chickenblog." I consider William one of my editors. He gently, thoughtfully suggests ideas for posts, and says encouraging things to me, like when 54% of the people taking this week's poll say they do not read Chickenblog, and are not sure where they are. We are pretty close to updating the look of our 2003 Odyssey. I find inspiration everywhere. 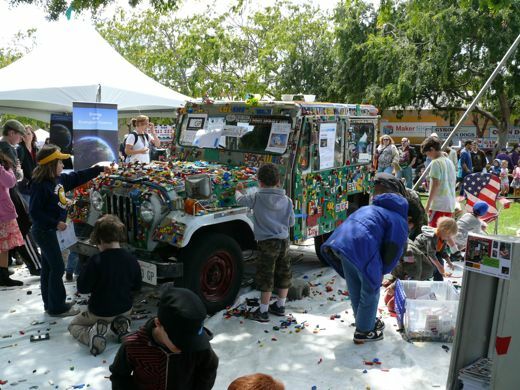 Maybe it's time to get the Lego bricks out of the van, and put them on the van. 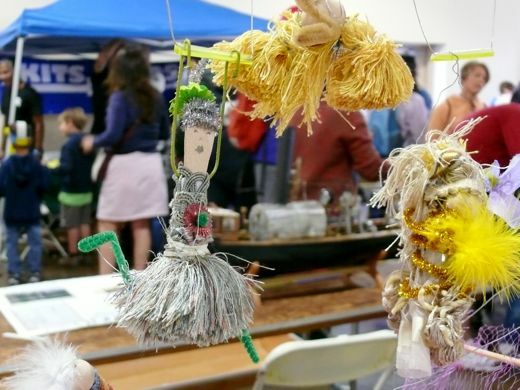 Look, here it is... Maker Faire is beautiful, because it is a place full of imaginative, creative people, and those same people are enthused about what they imagine and create, so they share, and they teach, and they laugh out loud. It is amazing spending time in this kind of environment. It is encouraging and affirming. It erases fear and cynicism. It is genuine ingenuity, and patriotism, and it is the real kind of initiative that can keep our country great, and make the world a better place. 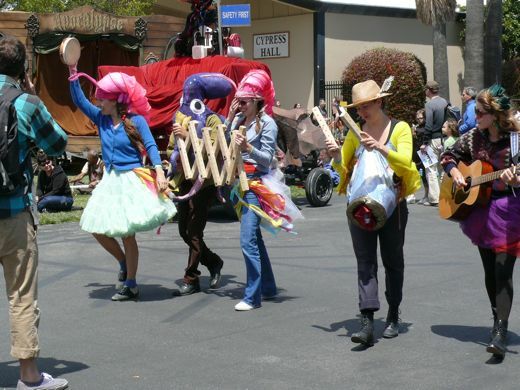 So, long live Maker Faire! 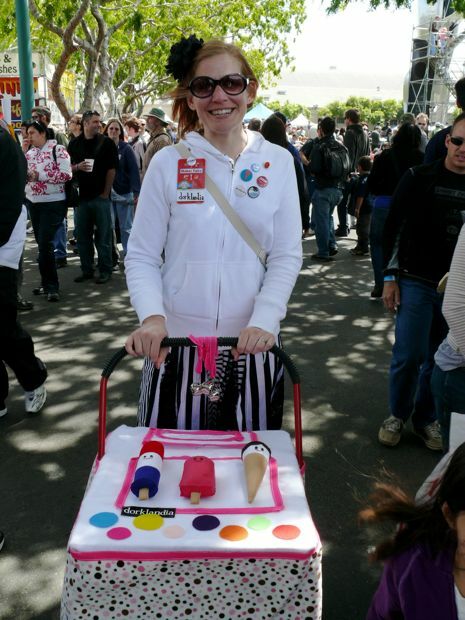 Seriously, this ice cream cart, loaded with felt ice cream plushies, was adorable. 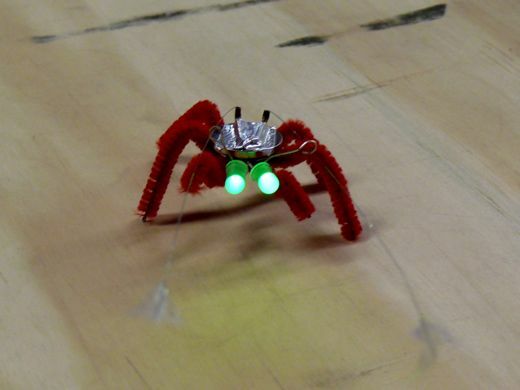 And long live Blinky Bugs! Enchanted by the Blinky Bugs. Ken Murphy was in the Make Shed, demonstrating how to make Blinky Bugs, and he showed me his kit-book, which is available for pre-order. I felt like I was from Dorklandia, greeting and meeting every artist, author, scientist and geek, with my usual enthusiasm and zeal. 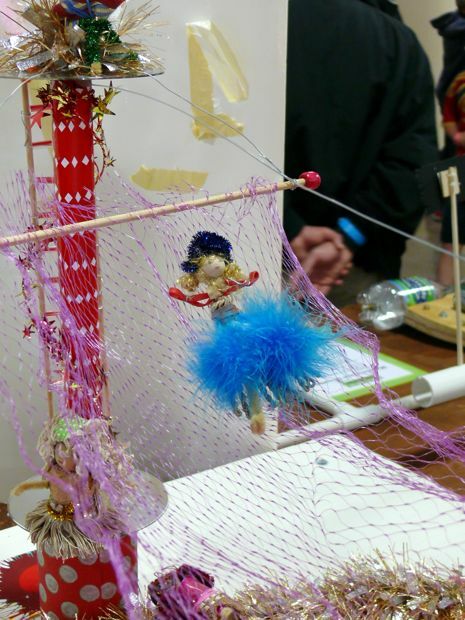 Makers and Thinkers and Tinkers are my heroes. Long live cycles... large, small, many wheels, mini-wheels, many pedals, new and old, all of 'em! 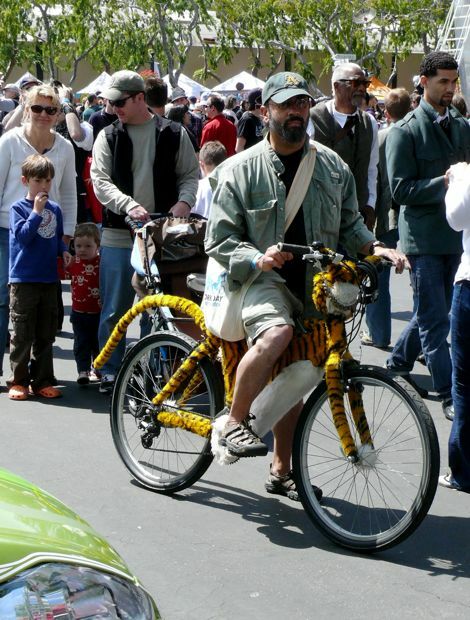 Tiger ride? He can swish his tail, of course. I want this real bad. 'cause it looks real good. I would even settle for it without the patterned shower of water that rains down from the top. 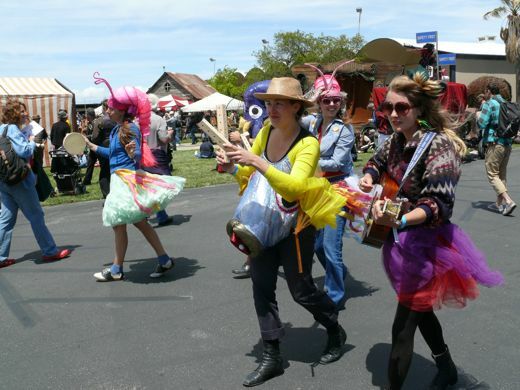 They make music at the Faire. They make it look fun. 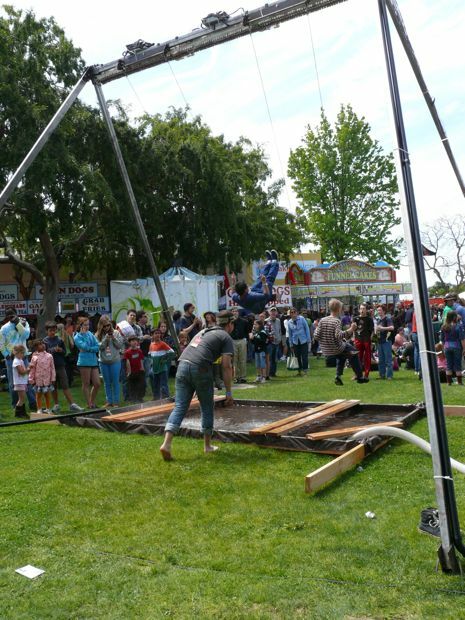 Speaking of fun, you don't have to build a walking, talking giraffe, or plug an oil leak to contribute at the Maker Faire. You can be as craftily creative as you please, which is what makes it fun for young, and mature, immature, and unsure, for all. Which is why I loved meeting Binka in theTeacher's Lounge-Educational Outreach space. 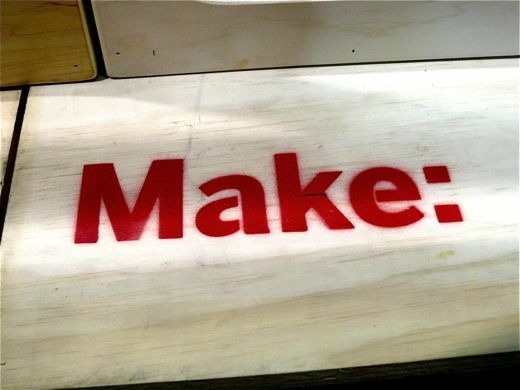 She sent me ideas and links for our family plans for future Maker Faire-Maker Club-Science Sunday ventures. Even if you just look at the pictures, and cannot bear to read one more enthusiastic-geek-zealous word, you gotta admit, this is pretty cool stuff. It's cool stuff, made by cool people, like the students from the You Made It! Jamboree. Please visit their website. They are doing great stuff. Children are learning. It's beautiful. Look at what Dylan made! This is awesome. 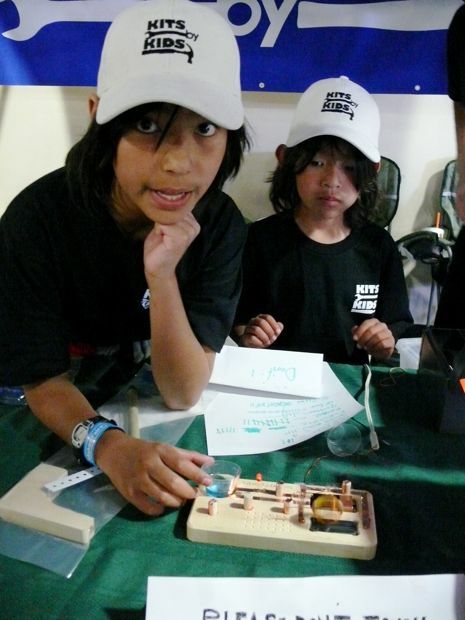 We met these boys in Sequoia Hall, and they were demonstrating and selling the science and project kits made by them. 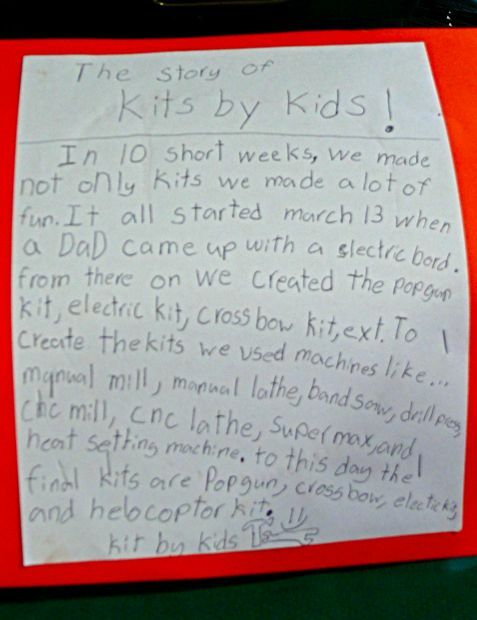 I brought home the circuit kit and a crossbow kit. I love reading their story, with the list of tools and machines they used to make their creations. Having spent plenty of time designing and building in a metal shop, Alex was both impressed and encouraging. 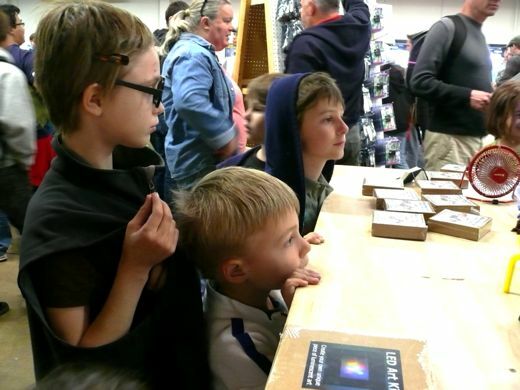 I think his FIRST experiences give him insight and appreciation for fellow science and technology enthusiasts. He knows FIRST outreach is a respectful exchange within his team, and between his team and his community. I can keep going. Dare me? 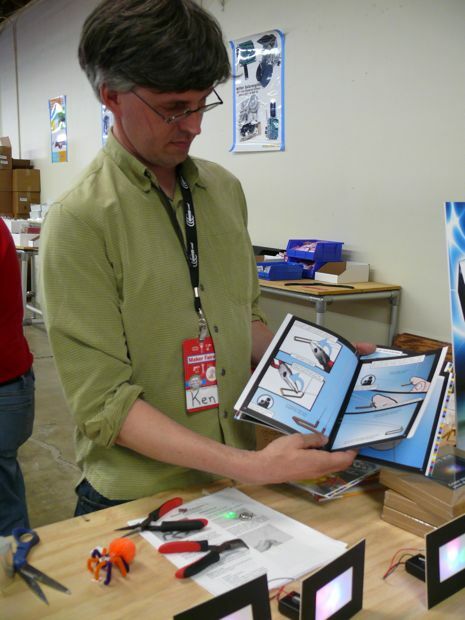 This was a missed opportunity: I should have bought Mark Frauenfelder's book in the Maker Shed. I can still get the book, but it would have been so cool to get it signed. I loved the things he was sharing, and thumbing through "Made By Hand", talking about backyard chickens... I soon realized I was chatting with another kindred spirit. I love that he covers the "joy" and "frustration" of a family going for a Do-It-Yourself life. 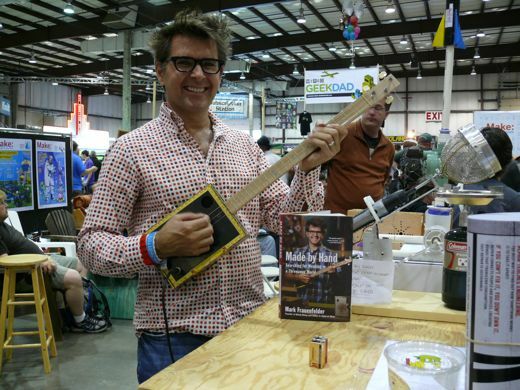 Plus: He is playing a cigar box guitar. He made it himself. There is meaning in that. 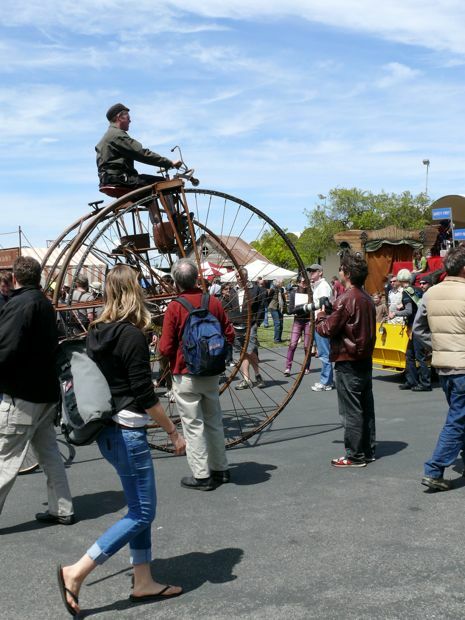 Long live the Tour de Maker! 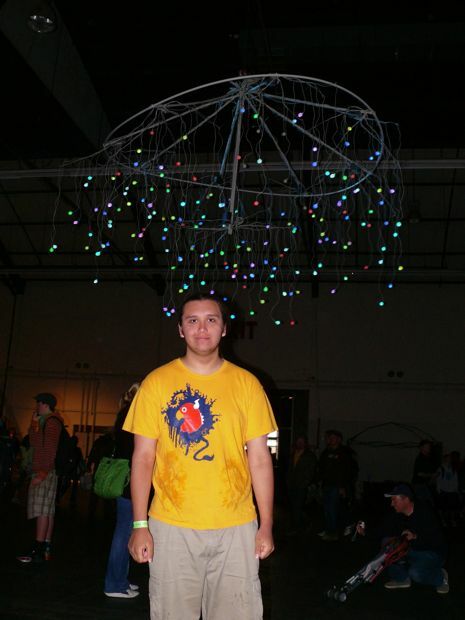 Your MakerFaire was much cooler than the one I visited while I was in the US last month. The one I went to was cool, but yours looks huge and inviting and creative. Thanks for sharing! Oh! 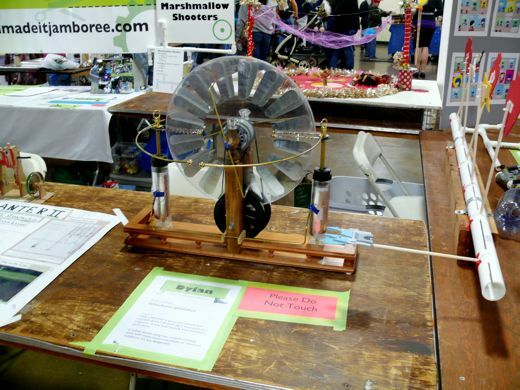 I went to somewhere similar to the Maker's Faire once! And I really like your blog. 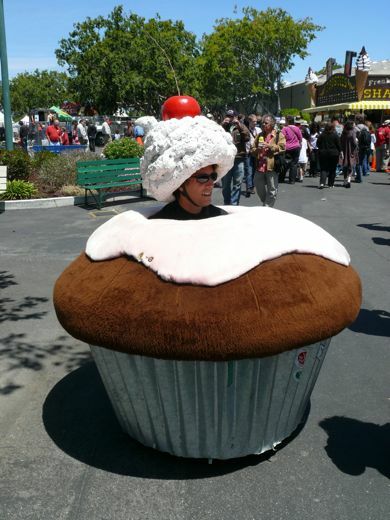 The man dressed in the cupcake suit, that picture was funny! Keep up the awesome posts! Congratulations on your 'Blog of Note' status! You deserve it. 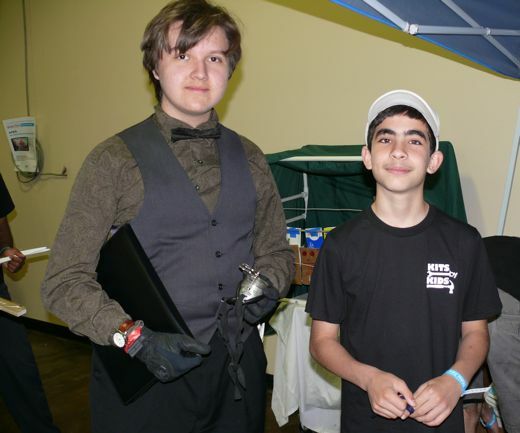 So glad you had a great time at the faire. Your enthusiasm comes across. I love those things too and yes, you will have plenty of fodder for your next few hundred Blogs! Glad you made 'Blog of Note' because that is how I found you! Great blog! Congrats on the blog of note. Looks like a great faire. Love it. That looks like so much fun! I love the one of the man in the cupcake. He must have a true and burning passion to do that all day long. Or maybe he's a Zen Buddhist. "I am the cupcake. I am one with the cupcake." Congratulations onf the "Blogs of Note." I love it! I love your blog! So random,and quirky and happy and COOL! Natalie, it seems that I've fallen down the rabbit hole and landed in a wonderfully quirky blog. I must say that you've got the bodger's stamp of approval. Bodgery aside, chickens rock! What advice might you have for a cove who wants a few egg-hatch, ground scratchin' funny noise makin, feather shakin galliformes? Geek friends who seeks friends... welcome all! Tony... any bodger can bring home chicas. You will need some space outdoors, sheltered and safe from predators. You will need a sense of humor, and a sense of daring. Chickens do rock! Email me and I will be more than happy to answer any questions. 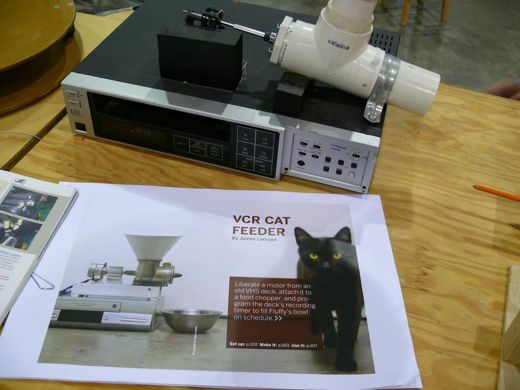 I want the VCR Cat Feeder!!!! Awesome! Also...it's my first time visiting so I was one of those 'No, where am I' people. Also, is it a cat named Benjamin Franklin referred to in header? I have one of those as well. I don't know if my first comment went through...it disappeared suddenly before I could finish...but anyway...I'll try again. Congratulations on your notable blog status! Only 600 pics? I can see why you would take so many..what an interesting experience. My favorites are the cupcake man and the very big cycle! Well, I absolutely loved your pictures. It looks like you lead an interesting life. I just found you on the notable blogs. :) Congratulations. Some of the pics had pvc stuff in them...isn't pvc the most awesome diy construction material on the entire planet Earth?! Well, maybe not the entire planet but you know what I mean...great pics AND text! make me jealous, because I'm in Indonesia and never seen like that in Indonesia (poor me)... Anyway its nice pics..
Like the blogs! So cool!